DWI schools or substance abuse assessment or alcohol assessment class are required for anyone with a DWI or DUI. Between July 2008 and June 2009, there were 44,832 DWI convictions in North Carolina. 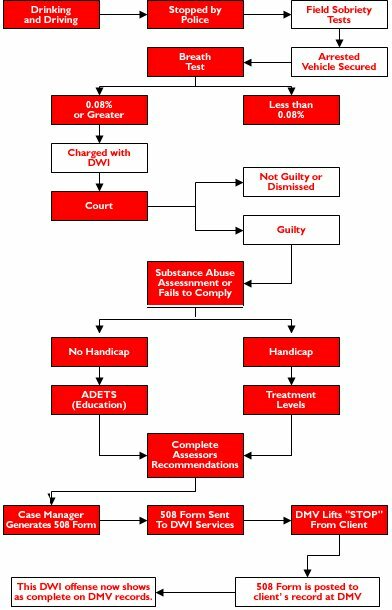 State law requires that DWI offenders obtain a substance abuse assessment and complete the recommended intervention, which is either education or treatment. The Division of MH/DD/SAS oversees this process, making sure that assessment and intervention conditions are satisfied. Between July 2008 and June 2009, 28,697 North Carolinian's completed the requirements. What is an alcohol assessment? An alcohol assessment is an hour-long evaluation provided by a private agency approved by the state of North Carolina. The DWI/DUI school will ask you questions about how much you drink, how frequently you drink,and other behavioral issues. The agency will make a recommendation to you about further treatment, if any, you should undergo. In most cases, the agency will at least recommend a 20 hour class. In some cases, the agency will recommend a 40 hour class or even more treatment. In order to restore your limited driving privileges during the thirty day initial suspension, you must provide an alcohol assessment to the court. You will also provide a DL123 form from your insurance agency. Our office can provide instant DL123 forms. This form shows the court that you have liability insurance as required by the state. The sooner you get your alcohol assessment, the sooner you can petition for limited driving privileges. What is the cost of the alcohol assessment? An alcohol assessment will cost $100. Cost for the recommended treatment varies by provider. Click below for a list of DWI Schools? Greensboro - A CDM Assessment & Counseling Of Guilford Inc.
"I needed DUI Insurance fast and was very worried about how high my payments would be. I called Brown-Phillips Insurance and got a new policy within 5 minutes and at almost the same price I was paying for my old policy without the DUI Insurance NC.